Gymboree Play & Music has offered a series of parent/child programmes - incorporating play, music and arts classes - for more than 25 years. They have more than 530 locations in 27 countries. We've supported their UK operation since its arrival here in 1998. 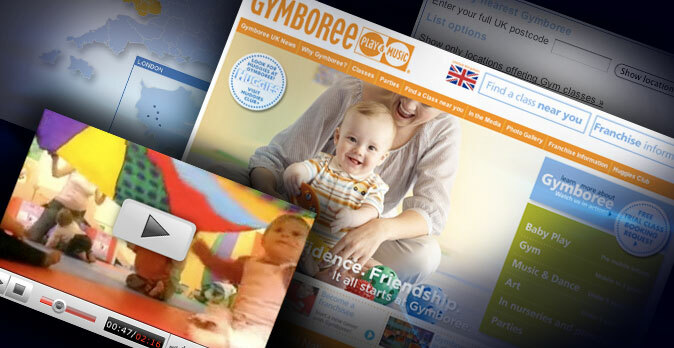 Based on the look and feel of their American parent site, Gymboree Play & Music UK's website gives information about the classes held at each site, alongside more general background and 'scene-setting' most often in the form of online video. A location finder allows users to search their five nearest Gymboree locations by postcode and enables free trial class requests to be made direct to any location. So that all Gymboree Play & Music UK franchisees can maintain up-to-date information on the web about their location, we created "content management-lite" in the form of a password-protected, web-based control panel from where they can each add and edit text and pictures that are automatically displayed on the public website. Further to this we created an administrator control panel so that the UK business owners can set up new franchisees and control their access. Addition of new locations to the website automatically generates short URLs based on the location name, adds the new site to the 'request a free class' page, and to the location page both in list form and on its map. Other back-end functionality provides the business owner with a complete document upload and distribution system so that up-to-date information can be provided via the website to franchisees. Re-development is currently underway to deliver an entirely content-managed website. In order to satisfy our client's wish to use trustworthy and extensible open source software, the re-vamped site will use WordPress for its underlying functionality, appropriately re-styled to satisfy Gymboree brand requirements and with bespoke functionality such as the location finder re-written to integrate with it.